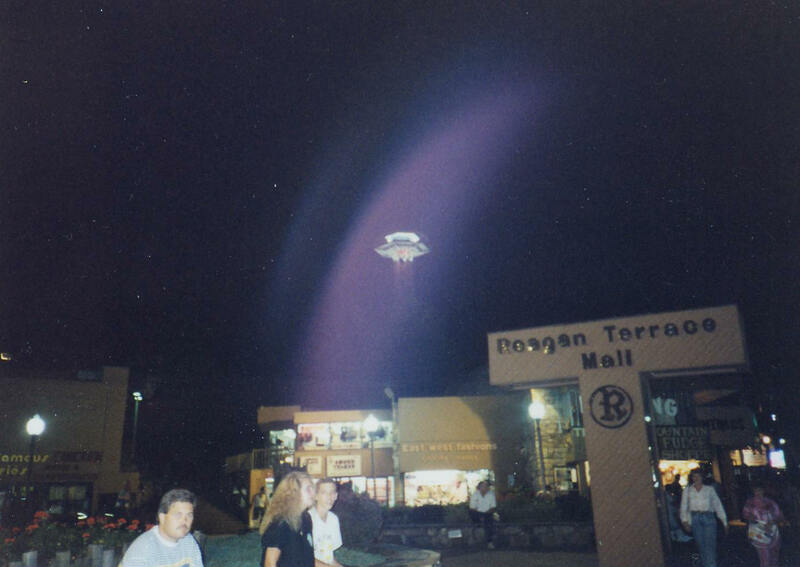 Located between The World of Illussions and Hauntings, Regan Terrace Mall has been home in the past to places such as The Stars Over Gatlinburg Wax Museum and the Sock makers. Before it was Regan Terrace Mall, it was Cooper's Court as this vintage postcard postmarked 1961 from the Vintage Postcard Page Shows. The Picture on the left was taken probably in the late 80's. 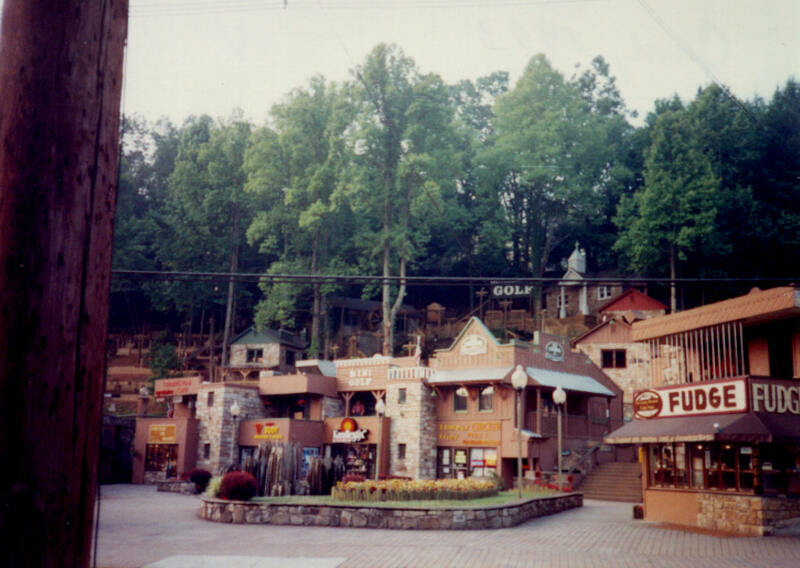 In the picture you can see The Stars Over Gatlinburg Wax Museum, one of two wax museums that use to be in Gatlinburg. It is now Fort Fun. 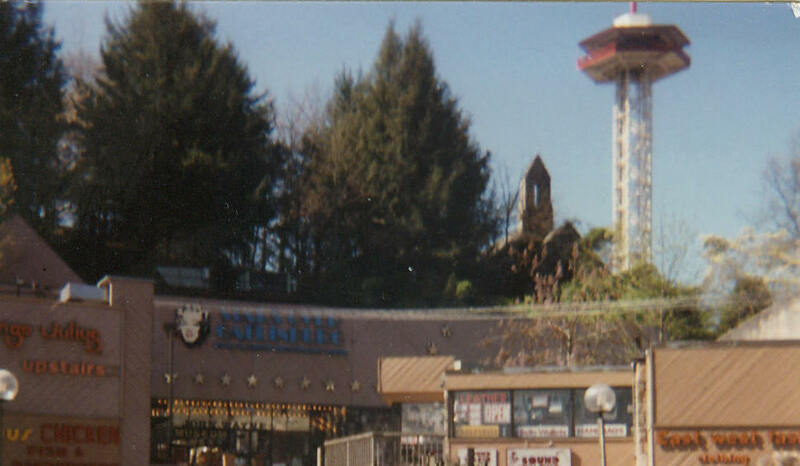 (see picture below) Behnd it is the Space Needle and the church that has been there forever. 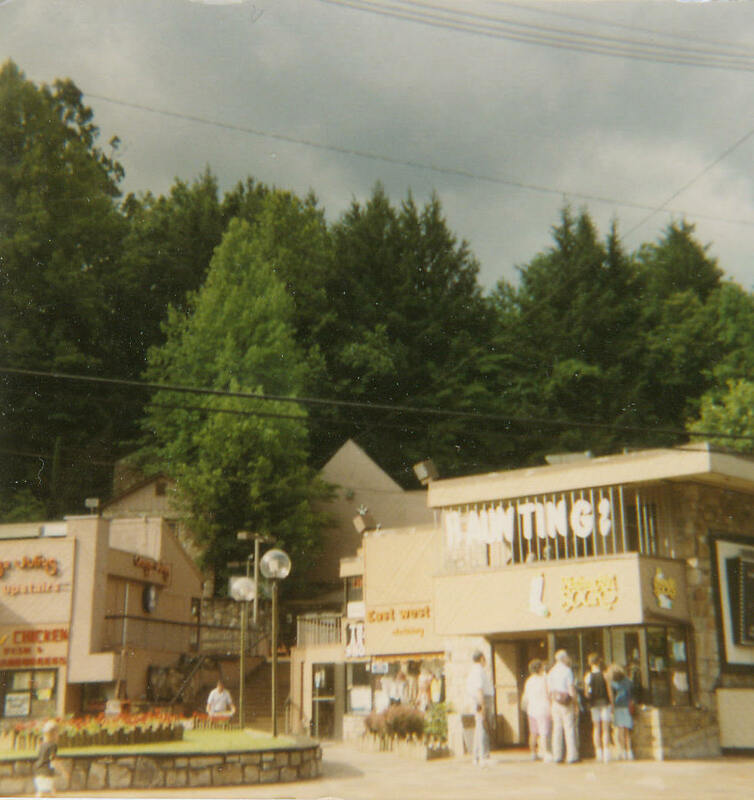 To the left you can see Orange Julius in what is now the Old Gatlinburg Golf admission shop. Also to the left is Famous Chicken, Fries and Hot Dogs a place that still remains today, however I believe it is for sale. 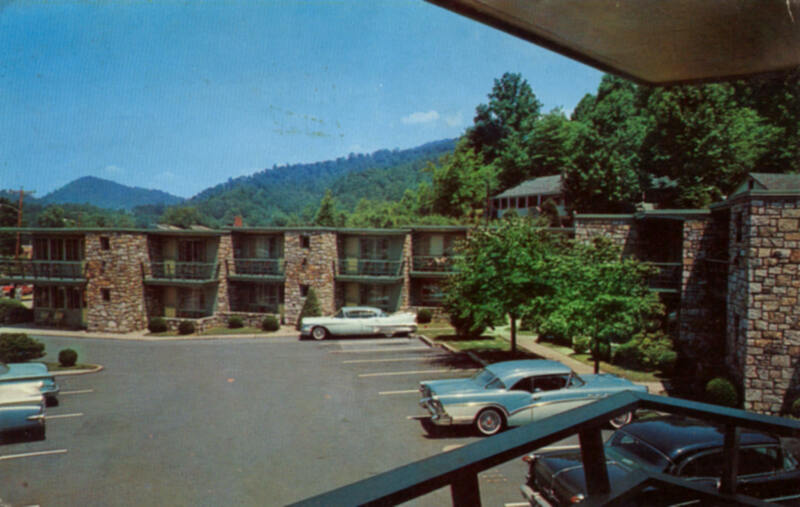 To the right of Stars Over Gatlinburg is Sound Tracks and East West Fashions. The picture on the right shows the same spot today except a little higher, and the church not quite as hidden behind trees. The picture on the left shows the old Haunting's advertisement on top and on the bottom is the old Sock place. I cannot tell or remember what the exact name of the place was, but I remember how you could stand there and watch the socks being made. 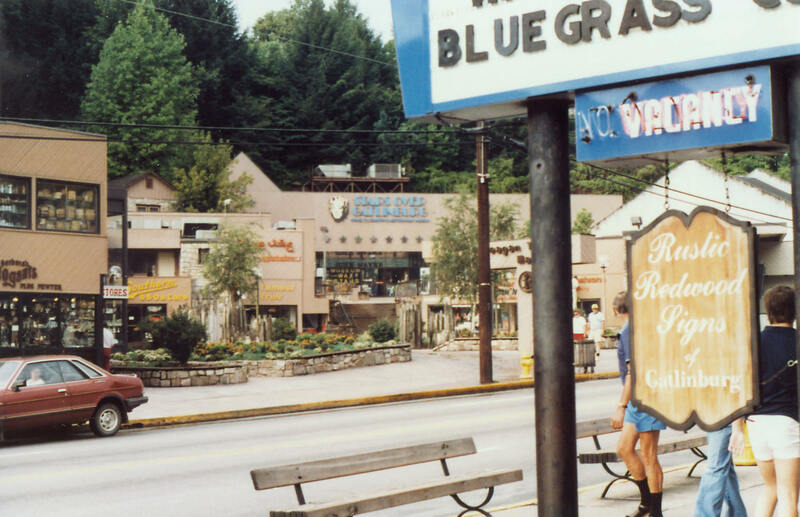 The picture on the right shows that the sock shop is now Fudge Shoppe of the Smokies. Two more recent photos of Hauntings before it closed in the mid-2010's. 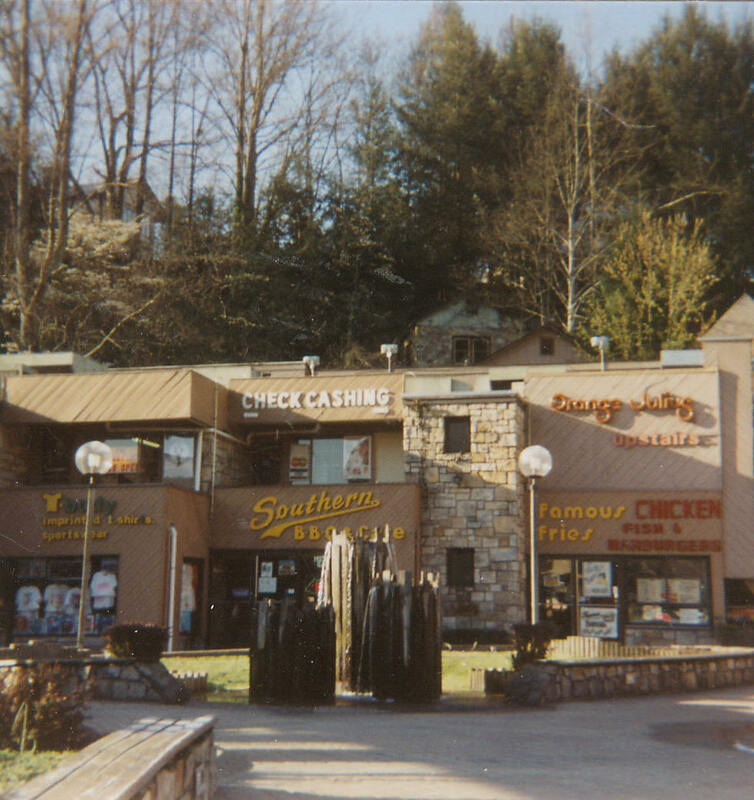 Two pictures of the Regan Terrace Mall showing Southern BBQ & Cafe as well as a check cashing place and Imprinted T-Shirts and Sportswear. 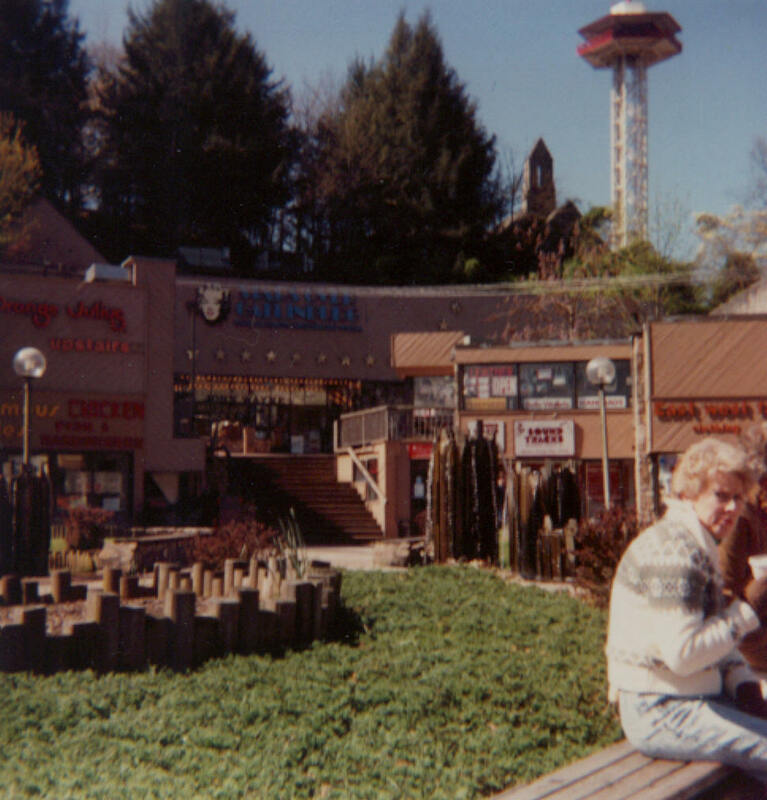 Also shown here is Orange Julius and The Stars Over Gatlinburg Wax Museum. In the front of the picutre, the sign for Riverside Motor Lodge can be seen. A Picture of The Relaxation Station and Nicks Gift Shop circa 2009 on the left. The Relaxation Station has become Bonedigity Barkery and Gifts and Nicks Gift Shop has become The Gift Corner as shown in the picture on the right. A Picture of Smoky Mountain Romance circa 2009 on the left. The picture on the right shows that it is now Burg Coffees. On the north most end of Regan Terrace Mall is The World of Illussions. 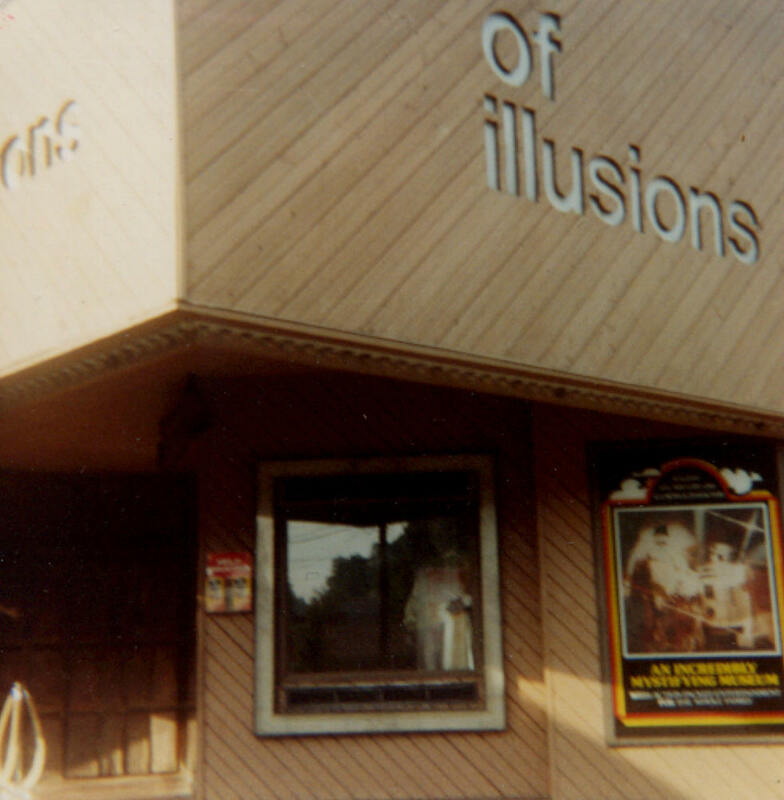 On the left is a photo of the front of World of Illusions from the late 1980's. On the right is a photo from 2011.